Indian Equity Markets continued with its winning streak on Friday as well as the benchmark index NIFTY inched up further and ended the day with net gains of 21.95 points or 0.21%. Despite the Markets ending with modest gains, the Markets have started to show some signs of consolidation. 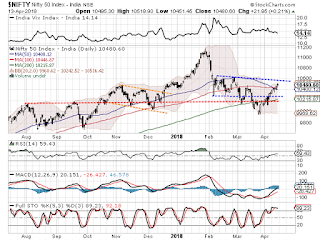 Few signs of some fatigue are evident and there are bright chances that the Markets may take some breather for a while before it prepares to continue with its up move again. Apart from the fact that the Markets looks little tired and overstretched on Daily Charts, the strikes on Syria carried out jointly by US, UK and France are likely to infuse some volatility in the global trade as well once again. However, these jitters may be short lived but in any case the present structure of the Charts point towards from highly probable range bound consolidation. The Monday will see levels of 10535 and 10560 will act as immediate resistance levels for the Markets. Supports come in at 10430 and 10410 zones. 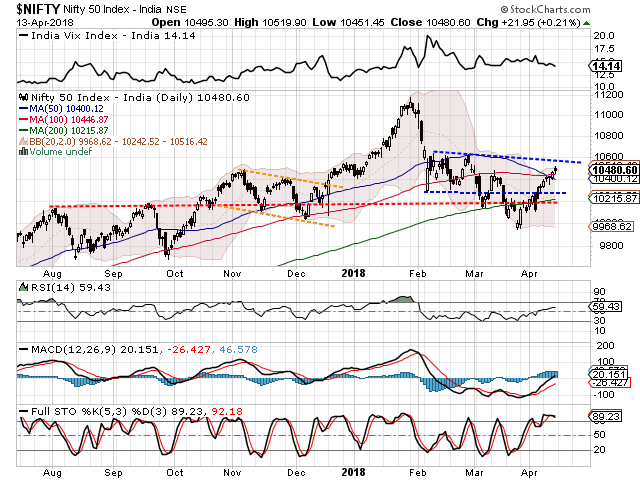 The Relative Strength Index – RSI on the Daily Chart is 59.4349 and it has continued to mark yet another 14-period high which is bullish. RSI remains neutral to the price showing no divergence. Daily MACD stays bullish while trading above its signal line. No significant formations were observed on Candles. Pattern analysis show some indicators which are little overstretched. They do not hold any potential to trigger any significant downsides in the Markets. However, they certainly can push the Markets into some consolidation in the immediate short term. Overall, there are some chances of global trade triggering some volatility but in any case, the consolidation is what is expected and no major downsides are seen. Whatever volatility that we may witness is expected to remain range bound. We advise to keep overall exposures moderate at higher levels and vigilantly protect profits as well. Downsides, if any, will present opportunity to make quality purchases once again. Long positions were seen being added in NATIONAL ALUMINUM, RCOM, HCC, ASHOK LEYLAND, IDFC BANK, TECH MAHINDRA, SAIL, HINDALCO, KPIT, COAL INDIA, NTPC, ESCORTS and FEDERAL BANK.